Living in Jakarta is indeed bittersweet. It is one of the most interesting city to live in, the urban life is great, and the selection of lifestyle is one of the most diverse in the world. But we all know the caveat: Jakarta is one of the top city with the worst traffic condition. Traffic is congested daily, if not hourly. This has an effect, especially to travelers wanting to catch a flight at the airport. In most of our days, traveling from the city to the airport makes up more time than being on the flight itself. A trip to the airport becomes somewhat feel like a mission to be completed: Beat Jakarta’s traffic to catch flight on time. Jakartans know that they can’t beat the traffic, they just can’t. So usually they play along with it, they go on the road early, spare around 4–5 hours before flight to ensure they will be at the check in date at least 90 minutes before flight (even sometimes, you’ll still miss your flight anyway). 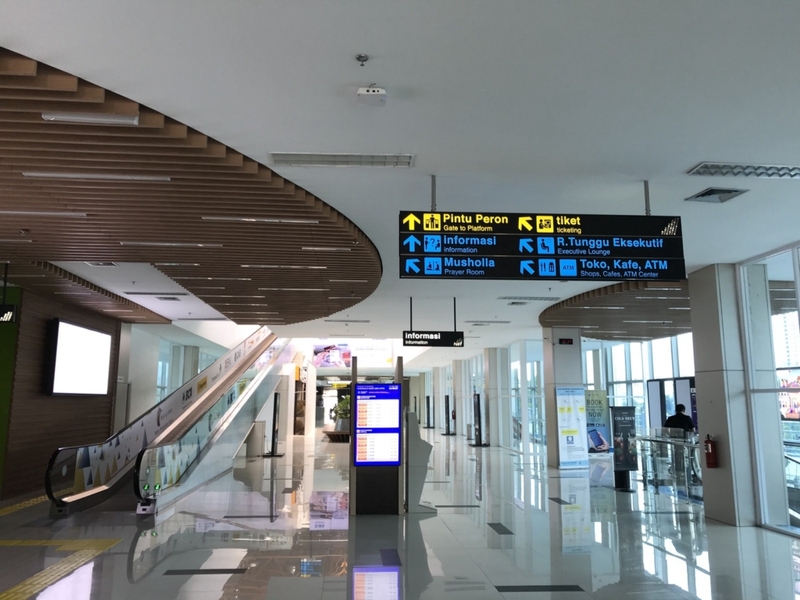 Enter Railink, ARS Soekarno-Hatta (Airport Railink Service) or simply Railink is a train service that transport passengers to Soekarno-Hatta airport from the city centre by only having to transit at several stations. 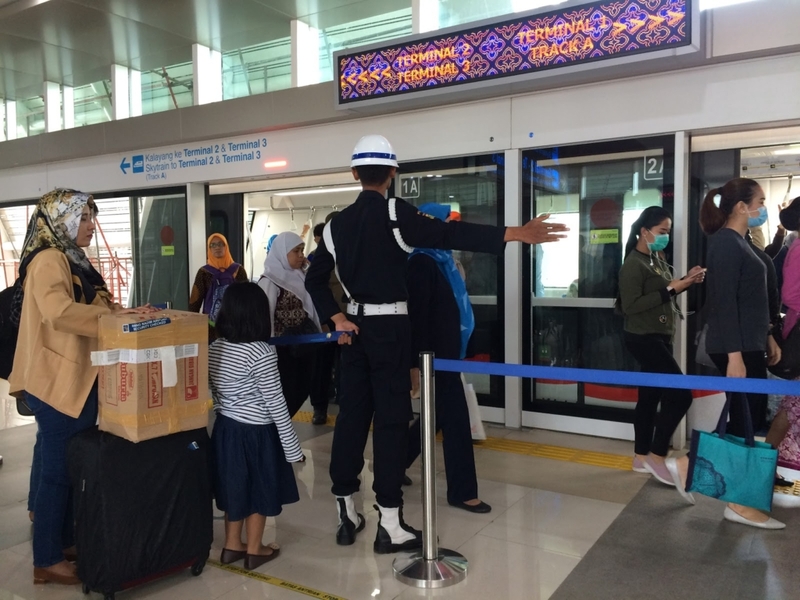 The benefit of using Railink is passenger can beat Jakarta’s traffic to reach the airport as it only takes less than an hour. This is what the public really need, a reliable, convenient, efficient and fast mode of transportation to address their need. 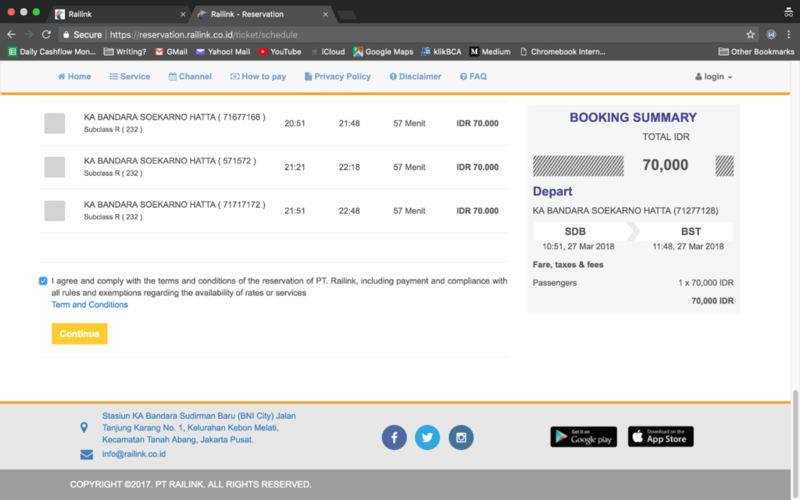 One way ticket costs about IDR 70,000, much 3x cheaper than taking a taxi to airport which would cost around IDR 200,000. This is indeed a promising update to the city’s infrastructure. Us, being regular travelers ourselves (due to out-of-town research or other projects), we are very much hopeful that the addition of this service will solve this airport-commute problem. We really do think that this service is actually on the right track (pun intended). The service is fully operated since the beginning of January this year and we are curious of the experience that the service delivers. Therefore, we tried using their official website to book ticket as well as rode the train itself. Let’s see how the experience turn up! Firstly, we need a ticket to ride. 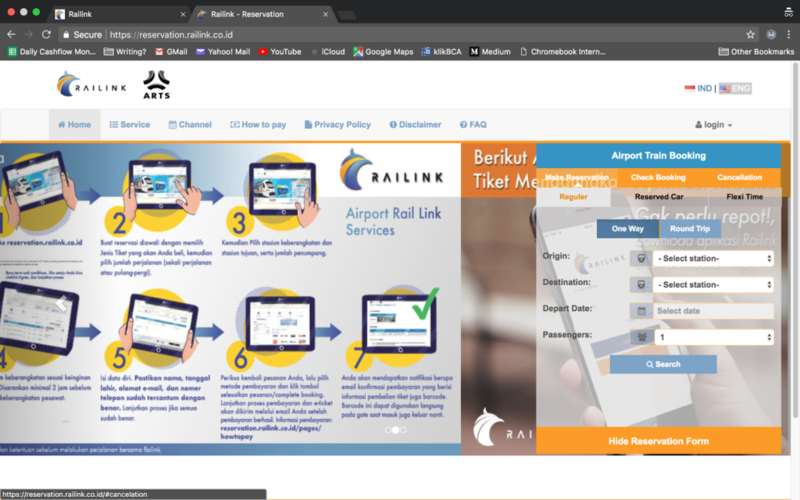 Our top of mind to buy a ticket without any hassle is through a digital channel, like the Railink’s official website. We expect that it will be ‘that’ easy to buy a ticket, just like another booking website. But we were (mostly) wrong. In general, we can say that the website would benefit from a major improvements here and there. The information presented was all over the place and we could barely find it. As an example, it was such a challenge for us just to find out where the reservation form was! Which we believe it is a crucial user flow to do reservation on the website. Thus, we encourage you to try the website by yourself, and see whether you have the same challenge like we did! We wanted to book a ticket for tomorrow schedule, so we needed to find how to buy tickets, but where? On the screen it has two “reservasi tiket” menus (ticket reservation), which each of them apparently linked to a different page. Ok, so we eventually clicked the ‘correct’ one and redirected to a new website (we wonder why). But, we still have the same question “where to buy tickets?”. Those pagination dots at the background was not helping, instead it distracted our process. Again..where/how do I buy tickets? Finally we found the form, can you guess which one? and where did it came from? In addition, the graphic underneath was distracting and makes it hard to get our focus. After filling up the fields on the form, this page look like a real booking page. The step journey also helped us to know where we at within the buying process. After we selected a schedule, we were lost for quite a long time since we could not find a way to continue. The yellow continue button that we see on the bottom was not present before and would not appear if we had not tick the “I agree terms and conditions”. Had we not tick it, we would be stuck on this page forever. In short, we can’t help it but to scream our frustrations out loud when we were trying to book just a couple of tickets. The overall website has low legibility, unclear placement of menus, and some illogical flow inside. The good news: we tried the app, and it’s way better. 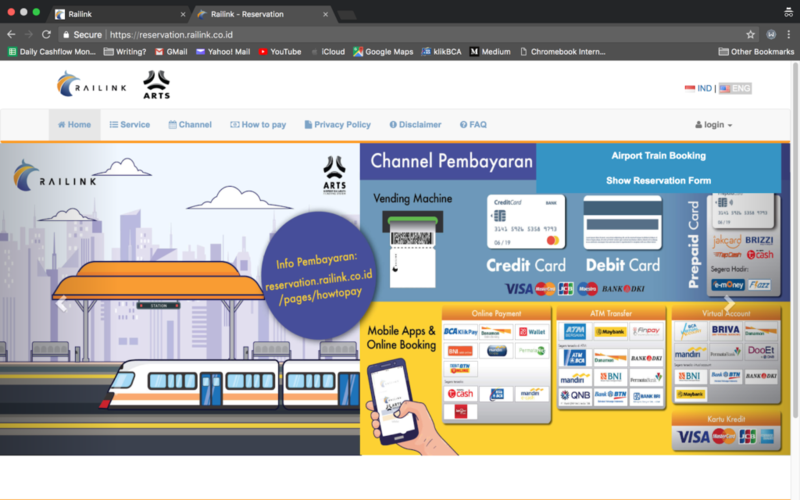 We just can’t seem to found a reason why we have to install an app just to get railink tickets. 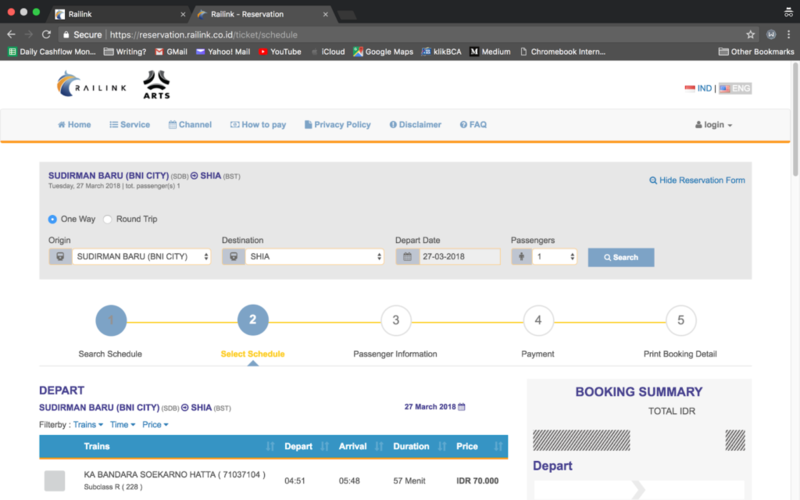 Knock, knock, Traveloka / Tiket.com / other OTAs? The process after schedule selection was actually smooth. There were not any crucial gaps other than the use of captcha for continuing to next steps (we are not a fan, are you?) Then we were heading to Sudirman Baru, which is the Railink Station in the city centre. The Sudirman Baru station was spacious and modern. But we were wondering why it felt so empty and have to get our head around for the navigation between ticket machines, gates and platform as seen on the diagrams below. 3 levels of the station: Ticket (top), Gate (mid), Platform (bottom). With these kind of layout, passengers that are arriving on the mid level have to go up a level to buy ticket, then back to mid level and finally go to the bottom level to board the train. It is not something that prevent us to board the train, but it took some time for us to figure out the flow. And we did ask repeatedly. Why the back-and-forth flow? When we were at the ticketing machine, we appreciated the fact that it accepted various debit cards to buy the ticket, which we found quite convenient. However, the interaction inside the interface was something that could be improved. At first we were confused to select the schedule we want since the list consisted of lines that have different highlights already. Fortunately we managed to select the schedule we want. In addition, the train name information (in codes) was something that was not useful as later on we did not need that information to board the train. After we got the printed ticket, we appreciated the instructions that we should scan the ticket to enter, but it did not specify in details how exactly to scan it as it seemed there was 2 scanners available. Luckily, there was a staff who helped us, he mentioned that the top scanner was for travel cards and the bottom scanner was for printed tickets (like we have) and it should be scanned facing down. Had the staff did not help us, we would be clueless how to enter the gate. When we arrived at the platform, we could not find any visual cues regarding train arrival nor current time. There was an announcement for passengers to go down to the platform about 10 minutes before the scheduled departure time, but there was no sign indicating when will the train comes until the train actually shows up. Finally we were onboard on the train. It was modern, clean and spacious. During the trip from Stasiun Sudirman Baru to Stasiun Soekarno Hatta, the train will stop at Stasiun Batu Ceper to pick up another passengers but there are no information about train position and arrival time. 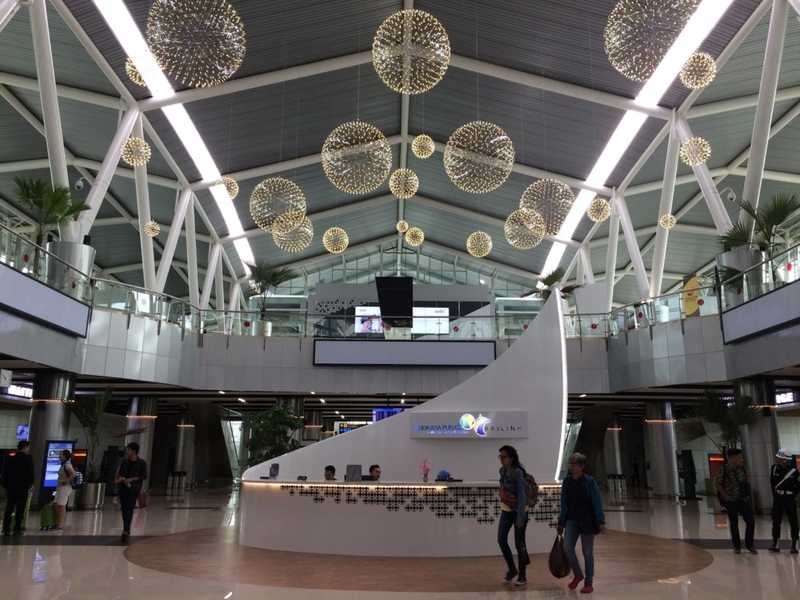 Finally, we arrived at the Soekarno-Hatta airport in less than 1 hour, which was pretty impressive. But, we had not yet arrived at the departure terminal since we have to take the skytrain (kalayang) to go there. The information board that shows which terminal to go was a bit hard to read with the Batik pattern as a background. The board should provide characters and symbols information that contrast with the background, light characters/symbol on dark background (or vice versa). We also observed that there was no information about train arrival. 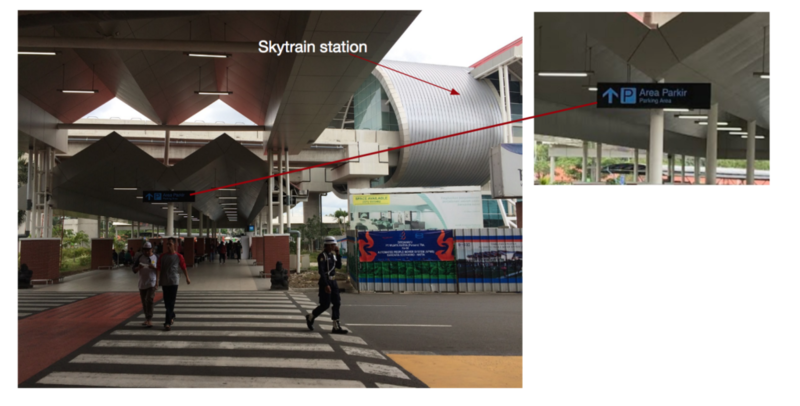 On our way back to Sudirman Baru from arrival terminal at the airport, we noticed there was a lack of signage and wayfinding to guide us back to the Railink station. When we finally entered the station hall, we were looking for ticket machines and looked for some visual cues. Unfortunately, we could not find one, so that we had to look for ourselves. Skytrain Hall entrance, nice, but where do I buy ticket? The ticket machines were somehow hidden in plain sight. 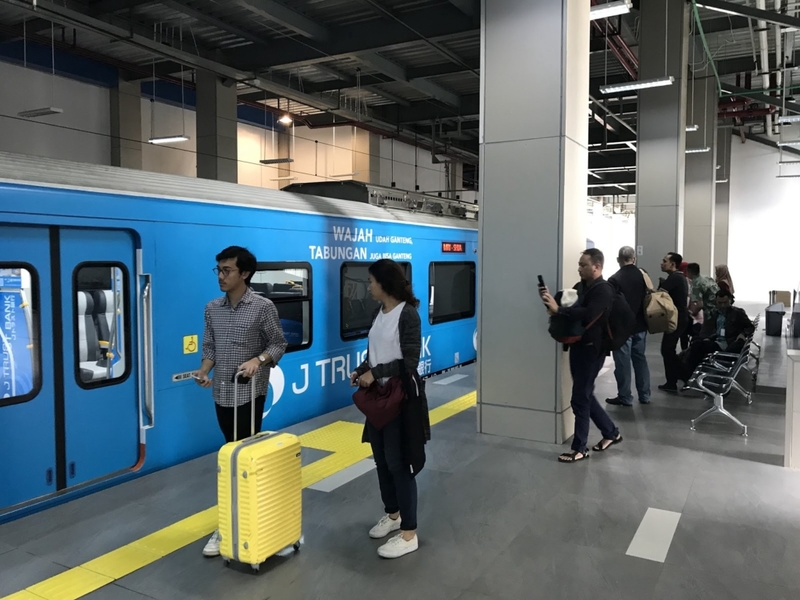 Railink has established itself as a transportation alternative to reach the airport from the city centre (and vice versa). However, public taxi and bus (DAMRI) still dominate the space since they are more reachable throughout the city compared to Railink which concentrated in the city centre and several areas. The other reason is, to reach Railink station in Sudirman Baru is a challenge by itself during the peak hours, so passengers just choose to take the taxi anyway. Apart from that, the new and modern infrastructure along with its system ought to deliver an enjoyable experience to the passengers. 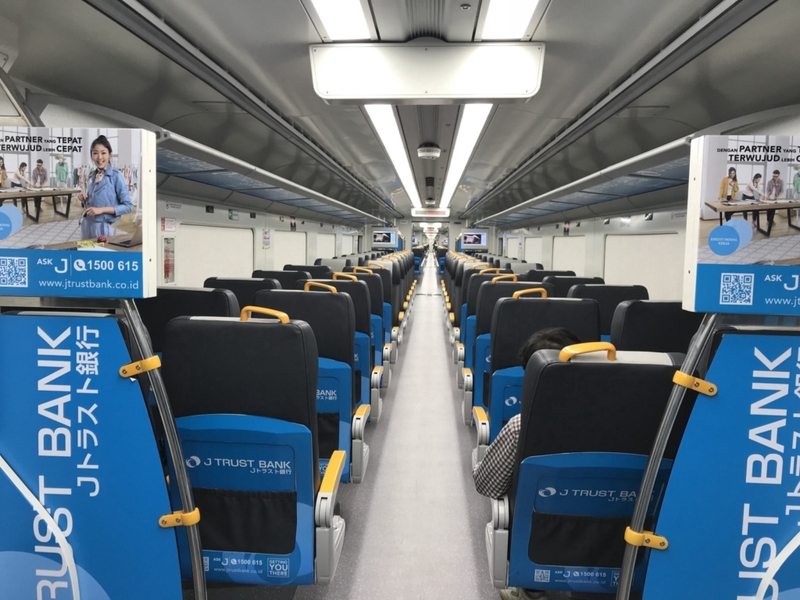 We think that Railink had done a good job in setting up all of the system and deliver a functional, reliable and convenient transport to its passengers. 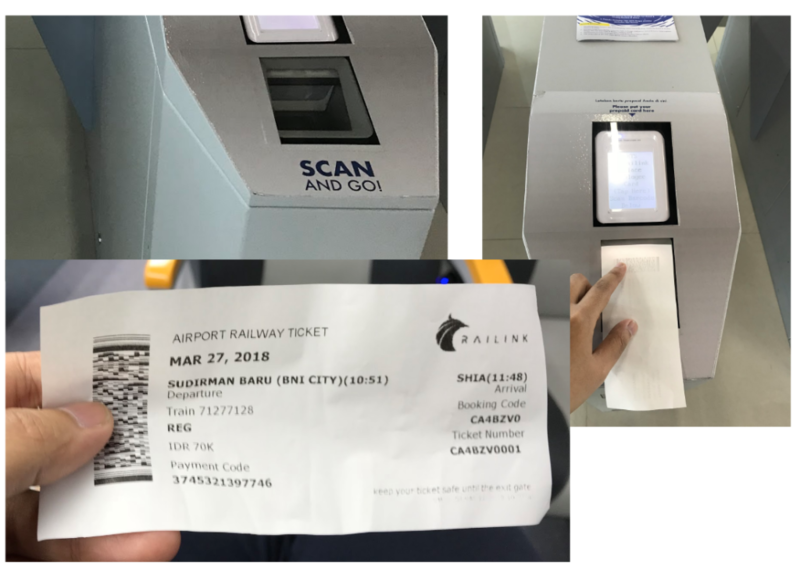 However, in order to deliver truly an enjoyable experience, Railink needs to re-assess and patch up some of the gaps along the passenger’s journey from buying the ticket until arriving at airport terminal. 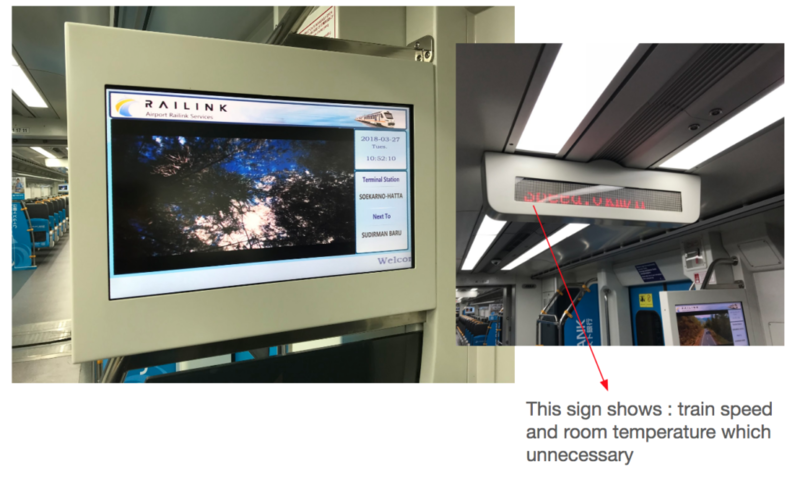 All of those moments in between ought to be supported with a mindful design decision that reflected on every Railink’s touchpoints, namely: website, app, ticket machine, gate, platform, signage, way findings and all of those that a customer interact with. In summary, we’re really glad that this service finally opened for public. It does solve user’s travel needs from the center of the city to the airport. It has cut our travel time more than half, and with affordable (or reasonable) ticket price. We still have high hopes to this service. And these high hopes aren’t really addressed at the moment, and we think that the overall experience of using this service could be improved more. How are we going to travel with ease from the railink station to the airport terminal? What if we have lots of baggages? How reliable is this service? 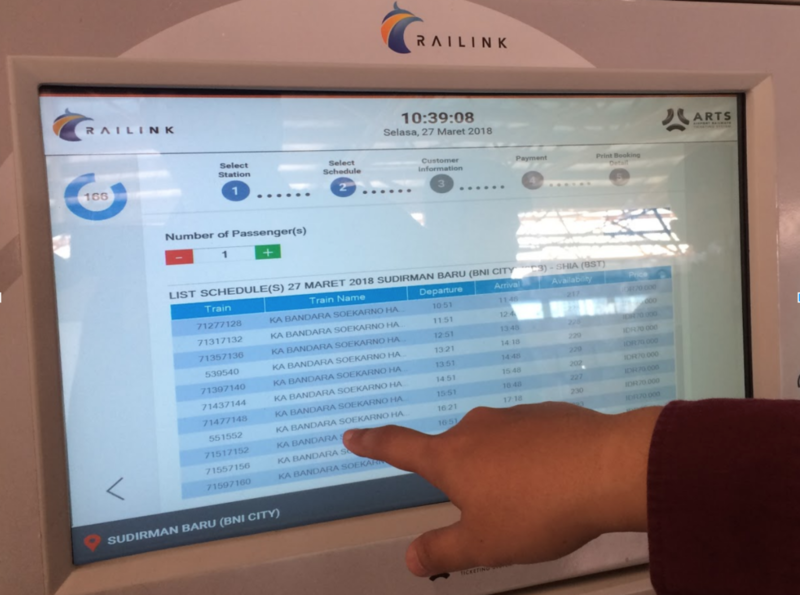 Will railink experience downtime? How are this potential downtime mitigated? These questions still give us some uncomfortable feeling when we try to trust our lives (and our jobs) using railink to catch our flight in the airport. 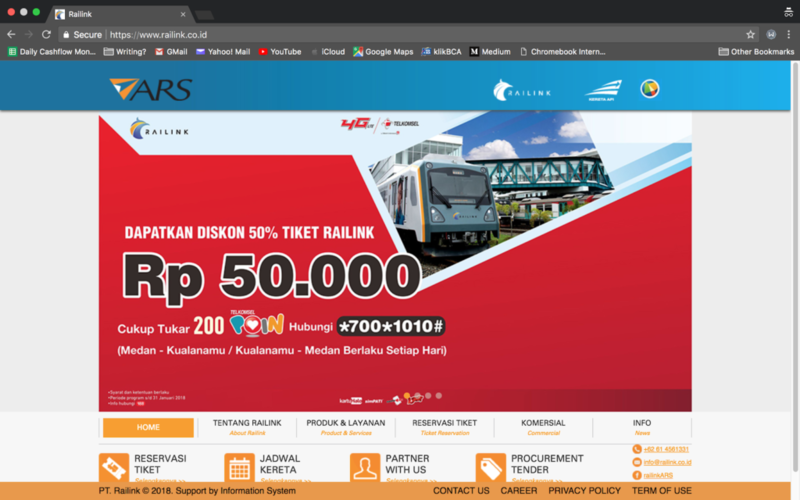 To be honest about our own preference, Railink still face tough competition from existing land transportation and taxi services. Although traffic jams are inevitable, these traditional land transportation from or to the airport still gives us perception of reliability, and also, convenience. We’d still appreciate the point-to-point service provided by traditional taxi services. No need to think about getting from one terminal to the other terminal. It’s as easy as hopping in and hopping out. But, we agree that railink is one big leap forward for Jakarta. We have to give it some time to evolve and adapt to our needs. How about you? Have you tried the service? What do you have in mind? do leave us some comments below.